We are throwing our biggest party to date! 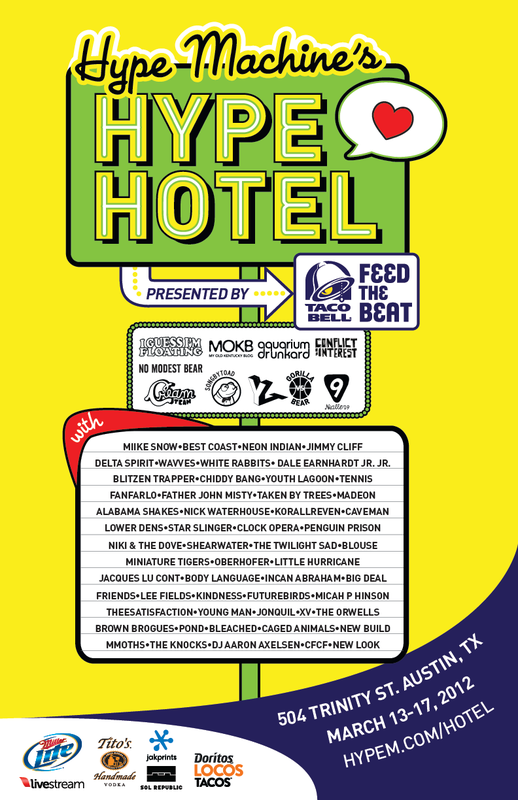 Hype Hotel, presented by Taco Bell’s Feed The Beat, is five straight days of music, drinks, and Taco Bell tacos, March 13-17 in Austin, TX. Lineups are curated by the terrific My Old Kentucky Blog, Song By Toad, Aquarium Drunkard, Gorilla vs. Bear, Yours Truly, No Modest Bear, Cream Team, I Guess I’m Floating, and Nialler9. This is the closest we’ve come to recreating the Hype Machine experience in real life, and we hope you enjoy your stay with us. A huge thanks to our sponsors: Taco Bell, Livestream, Miller, Tito’s Handmade Vodka, SOL REPUBLIC, Jakprints, High End Systems and Orange Amps. Our multi-day blog party is shaping up well and we need your help. We are looking for volunteer staff to help with production, registration, barbacking, and helping guests during March 13 – 17. You get all-access to the event, music, connections to bands, startups and the music industry (if that’s your thing). You must be 21+, love music, and be available on those days. Email austin@hypem.com, send us a link to your Facebook and Twitter, and tell us your favorite band of 2012.